Stephen Evanko: Stephen Evanko received his M.S. and Ph.D. degrees from the University of New Mexico in 1990 and 1993, respectively. His work focused on the response of connective tissues to alterations in mechanical loading and the role of proteoglycans and hyaluronan in the material properties of tendon and fibrocartilage. He then joined the laboratory of Dr. Thomas Wight in the Department of Pathology, University of Washington, as a postdoctoral fellow, studying the role of hyaluronan and proteoglycans in smooth muscle cell proliferation and migration. He is currently a research fellow in Cardiovascular Research at The Hope Heart Institute (Seattle, WA), where he continues to study hyaluronan in the biology of the artery wall and cardiovascular disease. The Hope Heart Institute, Seattle, Washingtona. a WFor Dr. Wight's profile, see Hyaluronan in Atherosclerosis and Restenosis in this series. The simple structure of hyaluronan belies the complexities of its biological functions and physico-chemical properties. From the regulation of cellular adhesion, locomotion, and cell growth and differentiation, to viscoprotection in joints and ocular surgical applications hyaluronan has an amazing repertoire of functions. The latest frontier of research on this versatile molecule is inside the cell, where hyaluronan and its associated intracellular hyaladherins may be performing a large array of novel and important functions. The work on this front is only beginning. The first reports that hyaluronan and other glycosaminoglycans had been detected in the cytoplasm and nucleus were published in the 1970s. Investigators employed various techniques, including metabolic radiolabeling and cell fractionation, or autoradiography. Glycoproteins and chondroitin were detected in nuclear and chromatin preparations from HeLa cells labeled with [3H]glucosamine1. Chondroitin-4-sulfate, chondroitin-6-sulfate, hyaluronic acid and heparan sulfate were found in nuclear preparations of rat brains2 and in hepatocytes3-5. Sulfated proteoglycans were detected in both the cytoplasm and nucleus in skin fibroblasts by high-resolution autoradiography6. These early studies were met with some skepticism due, in part, to lack of precision of cell fractionation techniques and other possible technical artifacts. Regarding hyaluronan, doubts were also generated by the subsequent finding that polymer synthesis occurred at the plasma membrane, making the notion of intracellular hyaluronan less plausible7. However, evidence for intracellular hyaluronan has continued to grow, and it is now clear that hyaluronan can get into cells to be catabolized and perhaps perform a number of important functions. The majority of recent evidence has come mainly from morphological studies using light and electron microscopy. These studies have utilized probes consisting of hyaluronan-binding molecules conjugated to colloidal gold or biotin, or fluorescently labeled hyaluronan. 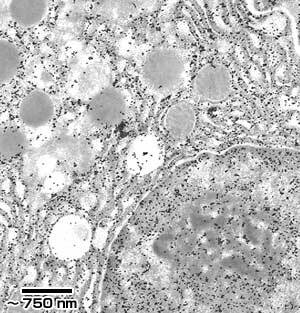 Using a testicular hyaluronidase-gold complex, intense gold labeling was seen in the rough endoplasmic reticulum in pancreatic cells and intestinal tissue8 as well as in oocytes and granulosa cells of the cumulus oocyte complex9. Pronounced labeling of the dense heterochromatin in the nuclear periphery and perinucleolar areas was also noted in these studies (Fig. 1). The specificity of this labeling was demonstrated by prior digestion of the sections with testicular hyaluronidase and incubation of the gold conjugated enzyme with excess hyaluronan. However, because testicular hyaluronidase is not absolutely specific for hyaluronan, some of the staining in these studies could represent chondroitin sulfate. Hyaluronidase-gold localization in pancreatic tissue. A portion of a pancreatic acinar cell is shown with heavy gold labeling of the nuclear heterochromatin, nucleolus and rough endoplasmic reticulum. Bar = 750 nm. Micrograph provided courtesy of Dr. Moise Bendayan, Department of Anatomy, Faculty of Medicine, University of Montreal, Montreal, Quebec, Canada. Other studies have employed probes which are more specific for hyaluronan, such as the hyaluronan-binding region of the cartilage proteoglycan aggrecan or cartilage link protein, neither of which bind chondroitin sulfate. In an in vivo study of rat brain, hyaluronan was localized intraaxonally and within a select few nuclei in cerebellar neurons, as well as in the cytoplasm of granule cells10. The selectivity of the distribution of hyaluronan inside only a few cells made it unlikely that this was an artifactual finding. In an ultrastructural study of vascular tissue from rats, both link protein-gold and aggrecan-gold were used to morphologically localize hyaluronan in vivo. In endothelial cells and smooth muscle cells, hyaluronan was detected more prominently in caveolated portions of the membrane than on the naked cell surface11 (Fig. 2). These authors also detected hyaluronan in nuclear heterochromatin. The specificity of the staining in these studies was confirmed by abolishment of the labeling by digestion with Steptomyces hyaluronidase, which is highly specific for hyaluronan. Detail of an arterial wall labeled with link protein-gold. Gold labeling (15-20 nm particles) is prominent on caveolated portions of the smooth muscle cell membranes. Magnification x 108,000. Micrograph provided courtesy of Dr. Peter Eggli, Institute of Anatomy, University of Bern, Bern, Switzerland. More recently, a biotinylated version of the hyaluronan-binding region of aggrecan has been used to demonstrate intracellular hyaluronan in cultured cells by light microscopy12, 13. Cultured cells offer the advantage that the hyaluronan in the pericellular matrix can be removed prior to permeabilization of the cells, which facilitates the visualization of the intracellular material (Fig. 3). By this method, hyaluronan is seen in smooth muscle cells and fibroblasts in a diffuse reticular network. 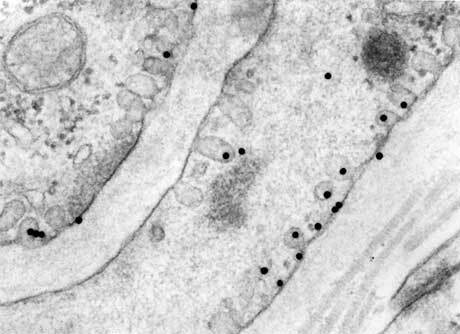 Hyaluronan is also detected in vesicles of various sizes. 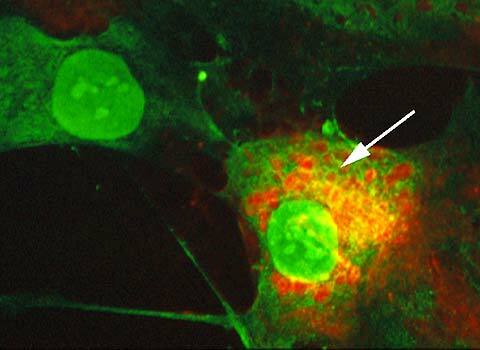 These appear to be endosomal vesicles based on internalization studies using fluorescein-labeled hyaluronan (see below). Also consistent with the electron microscopic studies, hyaluronan staining can be seen in the nucleus, most often associated with the nuclear periphery and/or nucleoli. Intracellular hyaluronan has been detected by this method in a variety of cells, including smooth muscle cells, endothelial cells, fibroblasts, normal mammary epithelial cells, mammary tumor cells and epidermal keratinocytes, indicating that intracellular hyaluronan may be a general phenomenon in cells which produce hyaluronan. Intracellular and nuclear hyaluronan. Histochemical staining for hyaluronan in human smooth muscle cells using the biotinylated hyaluronan-binding region of aggrecan and the peroxidase substrate AEC in (A) intact cells, (B) cells treated with Streptomyces hyaluronidase before fixation, (C) cells treated with hyaluronidase and then permeabilized, and (D) cells treated again with hyaluronidase after permeabilization. Arrows in C indicate nucleolar staining. Figure from reference 12, reproduced with permission. Various observations regarding the distribution of intracellular hyaluronan have been noted, but the significance of these findings is not yet clear. For example, in human skin fibroblasts, hyaluronan was distinctly associated with well-defined nuclear clefts and furrows. In some areas of subconfluent cultures of endothelial cells, hyaluronan appeared to be more prominent intracellularly than extracellularly. In certain mammary tumor cells, the intracellular hyaluronan had more of a globular appearance compared to the typical diffuse cytoplasmic staining, as if it was located in distended and irregularly shaped vesicles. This suggests that the morphology and distribution of hyaluronan within cells is dependent on cell type or other factors. Recent data suggest that intracellular hyaluronan may be involved in growth regulation and mitosis. Hyaluronan is synthesized in large amounts by mitotic cells14, 15, where it forms distinct pericellular matrices that can be visualized using a particle exclusion assay16. In the pericellular matrix, hyaluronan may promote membrane ruffling, focal adhesion turnover, and cell detachment and rounding, in part through the steric exclusion properties of the hyaluronan-dependent matrix. This pericellular coat also includes hyaluronan-associated molecules such as the aggregating proteoglycans, aggrecan and versican, and also link protein, TSG-6, and inter-a-trypsin inhibitor, all of which contribute to the physico-chemical and biological properties of the hyaluronan-dependent matrix. Hyaluronan also regulates cell function through signaling, which is mediated by cell surface receptors such as bCD44 and RHAMM. b See reviews by Knudson and Knudson and Turley and Harrison in this series. It is noteworthy, however, that in smooth muscle cells, fibroblasts, epidermal keratinocytes, and other cells, the increase in extracellular hyaluronan during mitosis is paralleled by a simultaneous increase in the amount of intracellular hyaluronan. For example, in 3T3 cells that have been growth arrested by serum deprivation, there is very little detectable intracellular hyaluronan. Following growth stimulation with serum or platelet-derived growth factor (PDGF), there is a steady increase in the amount of intracellular hyaluronan that appears to be maximal in the rounded mitotic cells (Fig. 4). Similarly, in rat epidermal keratinocytes, there was more intracellular hyaluronan in subconfluent cells compared to confluent cells13. Stimulation of confluent keratinocytes with epidermal growth factor stimulated an increase in intracellular hyaluronan staining, and, like the 3T3 cells, it was clearly stronger in the mitotic cells. An increase in the amount of intracellular hyaluronan in association with migration following in vitro wounding was also seen in keratinocytes. A high content of intracellular hyaluronan has also been seen in mitotic smooth muscle cells (Fig. 5). Intracellular hyaluronan is associated with mitosis. Examples of hyaluronan staining in permeabilized 3T3 cells after serum stimulation. (A) In control interphase cells, no staining is present. (B) At 24 h after serum stimulation, hyaluronan has accumulated in the cytoplasm and is concentrated near the nucleus. (C-F) Intense staining is seen in all mitotic cells at 27 h after serum stimulation. In late prophase/early prometaphase (C), chromosomes are arranged radially around a central area and staining can be seen between chromosomes. In metaphase (D), hyaluronan fills the cells and surrounds the chromosomes at the metaphase plate. 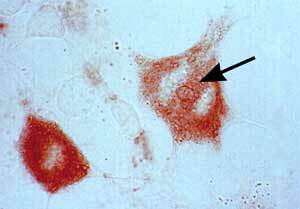 In anaphase (E), staining is present between the chromosomes as they move to opposite poles of the cell. Strong staining persists through telophase (F). Bar = 25 µm. Figure from reference 12, reproduced with permission. 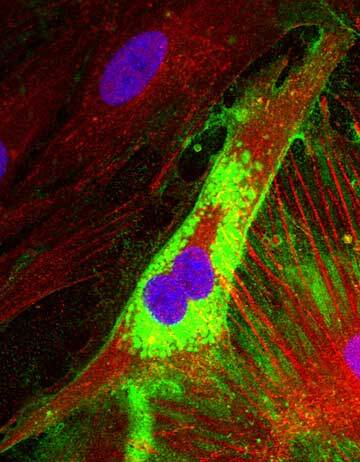 Confocal image of human colon smooth muscle cells stained for hyaluronan (green) and TSG-6 (red). Nuclei were counterstained with DAPI (blue). Micrograph provided courtesy of Carol De La Motte and Judy Drazba, The Cleveland Clinic Foundation, Cleveland, Ohio. During mitosis of 3T3 cells, hyaluronan staining appears to fill the entire cell and extend between chromosomes during prometaphase. Hyaluronan then fills the space between separating chromosomes in anaphase. Strong staining persists through telophase. Double staining with anti-tubulin antibodies indicates that hyaluronan colocalizes with the mitotic spindle and the centrosomes, but is certainly not confined to the spindle fibers (Fig. 6). Large, hyaluronan-positive vesicles have also been noted at the cleavage furrow of mitotic 3T3 cells (Fig. 7) and epidermal keratinocytes. Hyaluronan was previously found concentrated in large amounts extracellularly at the cleavage furrow, where it was proposed to aid in cytokinesis15, but its role in vesicles at this location is not clear. Thus, at the times when hyaluronan synthesis is high and the pericellular coat is the most pronounced, the amount of intracellular hyaluronan is at its peak as well. This suggests that hyaluronan is rapidly metabolized during proliferation and migration and may be performing a number of functions both inside and outside the cell. Hyaluronan-positive vesicles are present at the cleavage furrow. The example shows mitotic 3T3 cell with a large, prominent hyaluronan-positive vesicle at the future location of the cleavage furrow (arrow). There are only limited reports addressing the source of intracellular hyaluronan, and the mode of translocation to the cytoplasm and nucleus is not known. One study found that when growth-arrested 3T3 cells were stimulated with serum or PDGF and allowed to take up fluorescein-labeled hyaluronan for 24 h, the stimulated cells took up more of the exogenous labeled hyaluronan than did unstimulated cells. However, the fluorescein signal appeared to be restricted to large endosomal vesicles and did not colocalize with the endogenous hyaluronan in the rest of the cytoplasm (Fig. 8)12. This most likely suggests that the fluorescein-labeled hyaluronan was not as effectively translocated to cytoplasmic locations as endogenous unlabeled material. (This also points out the potential difficulties of using fluorescently labeled molecules in assessing function.) However, the possibility that a subpopulation of hyaluronan polymer can be deposited directly into the cytosol during synthesis at the inner face of the plasma membrane or synthesized within vesicles on the way to or from the cell surface has not been conclusively ruled out. In another study, 10T1/2 cells were shown to rapidly take up Texas Red-labeled hyaluronan in association with increased motility, and the signal appeared within minutes in the cytoplasm and nucleus, suggesting that hyaluronan is translocated from outside the cell17. Stimulation with the phorbol ester PMA enhanced uptake of Texas Red-labeled hyaluronan into the cytoplasm and nucleus and increased motility synergistically with hyaluronan. Hyaluronan uptake is increased in response to serum stimulation. Control and serum-stimulated cells were allowed to take up fluorescein-labeled hyaluronan (green) for 24 h and then were fixed and stained for endogenous intracellular hyaluronan (red). Control, quiescent cells showed minimal uptake of fluorescein-hyaluronan and no cytoplasmic staining for endogenous hyaluronan (A), whereas stimulated cells showed both enhanced uptake of fluorescein-labeled hyaluronan and intense hyaluronan staining in the cytoplasm. However, note that the localization of endogenous hyaluronan appears to be distinct from that in endosomal vesicles. Bar = 25 µm. Figure from reference 12, reproduced with permission. These studies suggest that hyaluronan internalization is tightly regulated and appears to occur simultaneously with the increased hyaluronan synthesis that occurs during cell migration and proliferation. This implies an important role for the processes of internalization, translocation and potentially, degradation, in the regulation of cell growth and motility. In another recent and perhaps more convincing study, endogenous intracellular hyaluronan in rat epidermal keratinocytes was abolished by pretreatment of the cells with hyaluronan oligosaccharides, suggesting that it is indeed internalized from the extracellular matrix13. Uptake was inhibited by the hyaluronan derivatives HA10 but not HA8 , or HA6 . Antibodies to CD44 that facilitate binding of hyaluronan caused an increase in the amount of intracellular hyaluronan, suggesting that CD44 that facilitate binding of hyaluronan is somehow involved in the process. FITC-hyaluronan was internalized into 200-600 nm cytoplasmic vesicles via a receptor-mediated endocytic pathway involving CD44 that operated independently of clathrin-coated pits. As indicated by a lack of colocalization with labeled dextran, a marker for pinocytosis, most of the intracellular hyaluronan was not derived from fluid phase endocytosis. Nor was it present in caveolae in these cells, as seen by lack of colocalization with caveolin 1, and lack of an effect of the inhibitors of caveolae formation, filipin and nystatin, on the amount of intracellular hyaluronan. Intracellular hyaluronan did not colocalize with a Golgi marker either. Most of the endogenous intracellular hyaluronan was of low molecular weight (<30 kDa). The inhibition of lysosomal function by chloroquine and ammonium chloride caused accumulation of intracellular hyaluronan, suggesting it is destined for eventual degradation. However, based on pulse-chase and degradation studies, the hyaluronan that is internalized by smooth muscle cells and other cells appears to be of low molecular weight to start with13, 18. In keratinocytes, once hyaluronan reaches the lysosomal compartment, it appears to be rapidly catabolized because very few, if any, of the very smallest oligosaccharides were detected intracellularly. Fluorescein-labeled hyaluronan has also been used to localize intracellular binding sites (Fig. 9) 12. In permeabilized, growth-arrested 3T3 cells, fluorescein-labeled hyaluronan bound prominently to nucleoli with little binding to the rest of the nucleus and the cytoplasm. Following stimulation with serum, there was a pronounced increase in the amount of binding of the labeled hyaluronan in the cytoplasm. Extensive binding was also seen throughout the nucleus and/or at the nuclear periphery and, in contrast to the control cells, was not confined mainly to nucleoli. This indicates that there is an increase and a redistribution of intracellular hyaluronan-binding molecules following serum stimulation which accompanies the increase in the amount of intracellular hyaluronan. In 3T3 cells and human smooth muscle cells, fluorescein-hyaluronan bound prominently to the periphery of vesicles which contained endogenous hyaluronan, suggesting there are hyaluronan-binding molecules around endocytic vesicles that may be involved in some sort of translocation process (Fig. 10). Redistribution of intracellular hyaluronan-binding sites after serum stimulation. Fixed and permeabilized 3T3 cells were incubated with fluorescein-labeled hyaluronan to localize intracellular binding sites in control cells (A) and cells stimulated with 10% fetal bovine serum for 24 h (B). In the control cells, the labeled hyaluronan bound primarily to nucleoli and slightly to a cytoplasmic network. In serum-stimulated cells, the fluorescein-labeled hyaluronan bound extensively in the cytoplasm, throughout the nucleus and nuclear periphery. Preincubation of cells with unlabeled hyaluronan abolished staining with the labeled hyaluronan (data not shown). Bar = 25 µm. Figure from reference 12, reproduced with permission. Binding of fluorescein-labeled hyaluronan to hyaluronan-containing vesicles. Human skin fibroblasts were fixed, permeabilized, and stained for endogenous intracellular hyaluronan (red) and then incubated with fluorescein-hyaluronan to examine hyaluronan-binding sites (green). Note the binding of the fluorescein-hyaluronan to the periphery of large vesicles positive for endogenous hyaluronan (arrow). Also note binding of fluorescein-hyaluronan to nuclear periphery and nucleoli. The observations that internalization of hyaluronan is associated with mitosis in a number of cell types and is greater following growth factor or serum stimulation are an apparent contradiction to previous studies showing that increased hyaluronan catabolism and hyaluronidase activity was associated with growth arrest by contact inhibition as cells reach confluencec. This may reflect either differences in the cells used or differences between growth arrest by serum deprivation versus contact inhibition. In any case, the role of hyaluronan catabolism in cell proliferation and motility is completely unknown, and will be the subject of future work in this area. Because hyaluronan fragments are known to have different biological activities than the high-molecular-weight material, the catabolism of hyaluronan and the generation of fragments, whether intracellularly or extracellularly, could play a critical role in regulating cell growth and motility. c See Mammalian Hyaluronidases by Stern and Csóka in this series. The recognition that hyaluronan is present intracellularly at key times during cell proliferation and migration suggests that it may have an intracellular mode of action in the regulation of these processes. One emerging possibility is that the processes of uptake, translocation, and possibly, degradation of hyaluronan may be integral to the signaling and regulatory mechanisms associated with the intracellular hyaluronan-binding molecules (IHABPs), or hyaladherins. However, this field is in its infancy, and most of the functional aspects of intracellular hyaluronan are still quite speculative. In addition, discriminating between intracellular and extracellular actions is experimentally challenging because crucial hyaluronan-mediated events may occur simultaneously both at the cell surface and within the cell. The model depicted in Fig. 11 shows a number of possible roles for intracellular hyaluronan. The limited data to date suggest that hyaluronan is probably internalized and translocated. However, the mode of translocation of hyaluronan into the cytoplasm or nucleus, if it indeed occurs by such a mechanism, is completely unknown. Hydrophobic patches on the hyaluronan polymer appear to allow interaction with itself19 and with phospholipids20, and this phenomenon may somehow be involved in its translocation. On the other hand, another possibility which has not been entirely ruled out is that a subpopulation of hyaluronan synthase enzymes may be oriented to direct synthesis of the polymer into the cytoplasm. Model depicting possible locations and functions of intracellular hyaluronan through interaction with known hyaluronan-binding proteins or hyaladherins. Hyaluronan clearly serves a structural role in the extracellular matrix, and it is easy to imagine that it may have an analogous function within cells. The association of hyaluronan with heterochromatin and the binding of exogenous hyaluronan to the nuclear periphery suggest that hyaluronan is part of the nuclear matrix, perhaps serving as a scaffold of some kind. Its abundance in mitotic cells suggests hyaluronan plays some role in this process. Interaction with phospholipids20 may suggest some role in membrane function during mitosis. Hyaluronan-containing vesicles at the cleavage furrow may relate to a proposed role for hyaluronan in cytokinesis15. There is also the intriguing possibility of a functional connection between the hyaluronan in nucleoli, the site of ribosomal RNA synthesis, and its reported presence in the rough endoplasmic reticulum, to where the ribosomes are transported. In hypertrophic chondrocytes of the expanding growth plate, most of the hyaluronan is intracellular, suggesting that it may be involved in cell expansion and hypertrophy in these cells21. The translocation of hyaluronan into the cytoplasm and nucleus might aid in the translocation of other molecules such as transcription factors, or steroids. On the less speculative side, several intracellular hyaladherins having an array of potential functions have been described, and more are sure to be discovered. RHAMM/ IHABP is a multifunctional hyaladherin, and is one of a number of hyaladherins containing the hyaluronan binding motif -BX7B-, where B is arginine or lysine and X is any non-acidic amino acid, and at least one additional basic residue lies within or adjacent to the motif. RHAMM is transiently flashed at the cell surface following exposure of the cells to hyaluronan and is involved in the regulation of hyaluronan-induced motilityd. RHAMM has been localized to podosomes and appears to be involved in focal adhesion disassembly. An intracellular version of RHAMM binds and promotes activation of ERK1 and can also attenuate ERK1 activity by subsequent growth factor exposure. RHAMM, which binds microtubules, has also been colocalized with ERK in the mitotic spindle, and thus may function as an accessory protein which brings this MAP kinase close to its substrates. Intracellular hyaluronan appears to codistribute partially with tubulin of the mitotic spindle (Fig. 6) and is clearly in the vicinity to be part of the regulatory processes in which RHAMM/IHABP participates. Thus, hyaluronan could serve as a kind of scaffold on which some of the signaling events take place. However, it is not yet clear if hyaluronan is actually part of a ternary complex with RHAMM and ERK1 or if the hyaluronan is bound to RHAMM while it performs its other putative intracellular actions. d See RHAMM, a member the hyaladherins by Turley and Harrison in this series. Another intracellular hyaladherin has been described and, through molecular cloning, was found to be identical with P32, a molecule which has been copurified with the splicing factor, SF222. P32 has several potential tyrosine sulfation sites and several phosphorylation sites which may act as substrates for ERK, protein kinase C, or casein kinase II. Casein kinase II, ubiquitous in the nucleus and cytoplasm of all cells, is known to phosphorylate SF2 and other pre-mRNA binding molecules. Therefore, the potential for casein kinase II phosphorylation makes P32 a candidate for regulation of the splicing activity of SF2. In this way, the localization of hyaluronan in the nucleus and its potential presence in the rough endoplasmic reticulum become relevant to the processes of mRNA splicing and gene expression. The vertebrate homologue of the yeast cell cycle control protein Cdc37 is another intracellular hyaladherin23. This molecule was cloned from a library made from embryonic chick heart muscle mRNA. The library was screened with a monoclonal antibody raised against a preparation of hyaluronan binding proteins from chick embryo brain. Cdc37 has the hyaluronan binding motif (-B(X7)B-), but not the characteristic tandemly repeated loop structure common to hyaluronan-binding molecules such as aggrecan, and link protein. Cdc37 is an essential component of cell cycle regulation in yeast. In addition to hyaluronan, the vertebrate molecule also binds chondroitin sulfate and heparan sulfate in vitro. Although its function in vertebrates is not yet known, there is evidence that Cdc37 may influence the activity of p34cdc2 kinase. It seems likely, therefore, that the binding of hyaluronan or other glycosaminoglycans to Cdc37 may mediate one or more events in cell cycle control. The most recently described intracellular hyaluronan-binding protein, termed IHABP4, was cloned by the same techniques as Cdc3724. IHABP4 has an expected size of 42 kDa, and has a cytoplasmic distribution. It contains multiple hyaluronan-binding motifs that are conserved among chick, mouse, and human homologues. Unlike other IHABPs, which are more ubiquitous, IHABP4 expression appears to be more restricted in adult mouse tissues. However, the function of IHABP4 is not yet known. CD44 is a principal cell surface receptor for hyaluronan which is known to associate with the cytoskeleton, undergo phosphorylation, and mediate regulatory events involved in cell growth and differentiatione. Neointimal formation in experimental models of atherosclerosis, inflammatory processes, and tumor metastasis are among the areas in which CD44 appears to play an important role. CD44 is also a primary mediator of the uptake and degradation of hyaluronan in many cells, including smooth muscle cells, fibroblasts, keratinocytes, and chondrocytes. In some cells, CD44 is internalized together with the bound hyaluronan through an endocytic pathway that appears to be separate from clathrin coated vesicles. Given that the biological effects of hyaluronan are clearly size dependent, this raises the possibility that the hyaluronan that is taken up and degraded may continue to function in regulating cellular events from within subcellular compartments. In support of this, it was found that mammary carcinoma cells lost their invasive potential when their ability to bind, internalize, and degrade hyaluronan was compromised by overexpression of soluble CD4425. Thus, some of the signalling which occurs through CD44 could occur from an internal location, such as endosomes or caveolae. Oligosaccharides of hyaluronan have various biological activities, such as inhibiting smooth muscle cell migration and proliferation. It has been presumed that this is due to prevention of hyaluronan-dependent pericellular matrix formation through blockade of cell surface receptors. It is equally likely that the oligosaccharides interfere with one of hyaluronans putative intracellular functions by preventing internalization, degradation, and/or translocation. e See The Hyaluronan Receptor, CD44 by Knudson and Knudson in this series. At present there is little direct data that either high molecular weight hyaluronan or the smaller fragments have an intracellular regulatory role or mode of action. Discriminating between intracellular and extracellular actions of hyaluronan will eventually be facilitated by more studies involving overexpression and knockout of the intracellular hyaladherins. Confirming that hyaluronan actively takes part in the regulation that occurs through the intracellular hyaladherins will require site directed mutagenesis to knock out the hyaluronan-binding capacity of these molecules and well-conducted functional studies. 1. Stein, G.S., Roberts, R.M., Davis, J.L., Head, W.J., Stein, J.L., Thrall, C.L., Van Veen, J. & Welch, D.W. Are glycoproteins and glycosaminoglycans components of the eukaryotic genome? Nature 258, 639-641, 1975. 2. Margolis, R.K., Crockett, C.P., Kiang, W.-L. & Margolis, R.U. Glycosaminoglycans and glycoproteins associated with rat brain nuclei. Biochim. Biophys. Acta 451, 465-469, 1976. 3. Furukawa, K. & Terayama, H. Isolation and identification of glycosaminoglycans associated with purified nuclei from rat liver. Biochim. Biophys. Acta 499, 278-289, 1977. 4. Furukawa, K. & Terayama, H. Pattern of glycosaminoglycans and glycoproteins associated with nuclei of regenerating liver of rat. Biochim. Biophys. Acta 585, 575-588, 1979. 5. Fedarko, N. & Conrad, H. A unique heparan sulfate in the nuclei of hepatocytes: structural changes with the growth state of the cells. J. Cell Biol. 102, 587-599, 1986. 6. Fromme, H.G., Buddecke, E., Figura, K.V. & Kresse, H. Localization of sulfated glycosaminoglycans within cell nuclei by high-resolution autoradiography. Exp. Cell. Res. 102, 445-449, 1976. 7. Prehm, P. Hyaluronate is synthesized at plasma membranes. Biochem J 220, 597-600, 1984. 8. Londono, I. & Bendayan, M. High-resolution cytochemistry of neuraminic acid and hexuronic acid-containing macromolecules applying the enzyme-gold approach. J. Histochem. Cytochem. 36, 1005-1014, 1988. 9. Kan, F.W. High-resolution localization of hyaluronic acid in the golden hamster oocyte-cumulus complex by use of a hyaluronidase-gold complex. Anat. Rec. 228, 370-382, 1990. 10. Ripellino, J.A., Bailo, M., Margolis, R.U. & Margolis, R.K. Light and electron microscopic studies on the localization of hyaluronic acid in developing rat cerebellum. J. Cell Biol 106, 845-855, 1988. 11. Eggli, P.S. 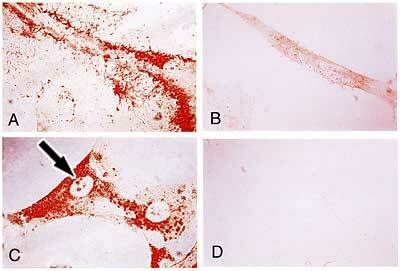 & Graber, W. Association of hyaluronan with rat vascular endothelial cells and smooth muscle cells. J. Histochem. Cytochem. 43, 689-697, 1995. 12. Evanko, S.P. & Wight, T.N. Intracellular localization of hyaluronan in proliferating cells. J. Histochem. Cytochem. 47, 1331-1341, 1999. 13. Tammi, R., Rilla, K., Pienimaki, J.-P., MacCallum, D., Luukonen, M., Hascall, V. & Tammi, M. Hyaluronan enters keratinocytes by a novel endocytic route for catabolism. J. Biol. Chem. 2001, in press. 14. Brecht, M., Mayer, U., Schlosser, E. & Prehm, P. Increased hyaluronate synthesis is required for fibroblast detachment and mitosis. Biochem. J. 239, 445-450, 1986. 15. Tammi, R. & Tammi, M. Correlations between hyaluronan and epidermal proliferation as studied by [3H]glucosamine and [3H]thymidine incorporations and staining of hyaluronan on mitotic keratinocytes. Exp. Cell Res. 195, 524-527, 1991. 16. Evanko, S.P., Angello, J.C. & Wight, T.N. Formation of hyaluronan- and versican-rich pericellular matrix is required for proliferation and migration of vascular smooth muscle cells. Arter. Thromb. Vasc. Biol. 19, 1004-1013, 1999. 17. Collis, L., Hall, C., Lange, L., Ziebel, M., Prestwich, R. & Turley, E. Rapid hyaluronan uptake is associated with enhanced motility: implications for an intracellular mode of action. FEBS Letters 440, 444-449, 1998. 18. McGuire, P.G., Castellot, J.J. & Orkin, R.W. Size-dependent hyaluronate degradation by cultured cells. J. Cell. Physiol. 133, 267-276, 1987. 19. Scott, J.E., Cummings, C., Brass, A. & Chen, Y. Secondary and tertiary structures of hyaluronan in aqueous solution, investigated by rotary shadowing-electron microscopy and computer simulation. Hyaluronan is a very efficient network forming polymer. Biochem. J. 274, 699-705, 1991. 20. Pasqualli-Ronchetti, I., Quaglino, D., Mori, G. & Bacchelli, B. Hyaluronan-phospholipid interactions. J. Structural Biol. 120, 1-10, 1997. 21. 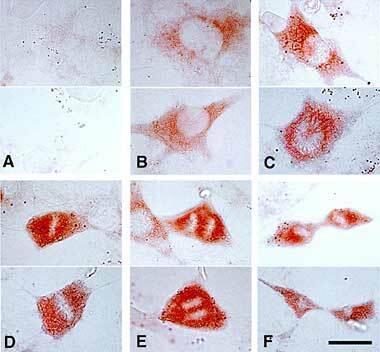 Takada, Y., Sakiyama, H., Kuriiwa, K., Masuda, R., Inoue, N., Nakagawa, K., Itano, N., Saito, T., Yamada, T. & Kimata, K. Metabolic activities of partially degenerated hypertrophic chondrocytes: gene expression of hyaluronan synthases. Cell Tissue Res. 298, 317-327, 1999. 22. Deb, T.B. & Datta, K. Molecular cloning of human fibroblast hyaluronic acid-binding protein confirms its identity with P-32, a protein copurified with splicing factor SF2. J. Biol. Chem. 271, 2206-2212, 1996. 23. Grammatikakis, N., Grammatikakis, A., Yoneda, M., Yu, Q., Banerjee, S.D. & Toole, B.P. A novel glycosaminoglycan-binding protein is the vertebrate homologue of the cell cycle control protein, Cdc37. J. Biol. Chem. 270, 16198-16205, 1995. 24. Huang, L., Grammatikakis, N., Yoneda, M., Banerjee, S. & Toole, B. Molecular characterization of a novel intracellular hyaluronan-binding protein. J. Biol. Chem. 275, 29829-29839, 2000. 25. Yu, Q., Toole, B. & Stamenkovic, I. Induction of apoptosis of metastatic mammary carcinoma cells in vivo by disruption of tumor cell surface CD44 function. J. Exp. Med. 186, 1985-1996, 1997.